Microscopes make great educational gifts! This guide will help you navigate through Microscope World and end up with a unique gift for your loved ones. Recommendation: Keep it simple with a low power 20x microscope for viewing insects, flowers, rocks, etc. Younger kids are often very interested in science, but they can't yet quite wrap their head around cells and biological specimens that can not be seen by the naked eye. However, they do love to look at things they are already familiar with such as flowers, rocks, toys from around the house, a dollar bill, etc. The MW1-L1 microscope provides 20x magnification and needs no light, cord, or batteries for operation. The single eyepiece is perfect for young kids to look through (rather than some binocular microscopes where the eyepieces can be too far apart for young children). 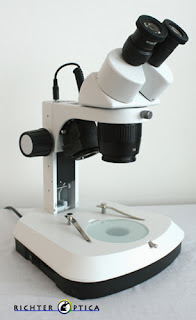 Recommendation: A kids high power microscope with one prepared slide kit provides out of the box viewing and enjoyment. Elementary school age kids find it fascinating to look at microscope slides or Protozoans swimming in pond water. It can be a bit tricky for kids of this age to prepare their own slides, so prepared slides are usually the best route when starting off with a high power microscope for Elementary school age students. Recommendation: A digital high school microscope allows high school students to document images and save them into reports. 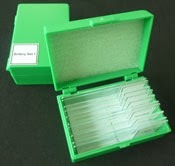 Include a box of blank slides and cover slips so they can make their own slides. High School students will have biology classes and can integrate their microscope into school work. A digital microscope allows them to view live images on the computer and capture and save images. The included software can make measurements as well. Recommendation: A stereo microscope with magnification somewhere between 10x-40x is best for viewing stamps, coins, collections, etc. 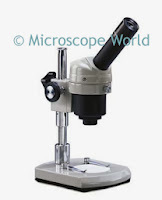 Hobby microscopes allow the user to look at small parts or collections. Model railroaders or model builders paint small pieces and glue together parts. Stamp and coin collectors will want to examine dates and defects. Needle-pointers want to view small stitches. All of these hobbyists will do best with magnification somewhere in the range of 10x-40x. 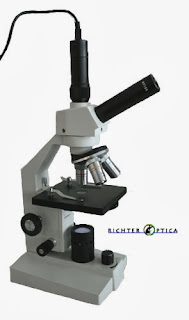 A dual power microscope with 10x and 30x is less expensive than a zoom microscope. Didn't find what you were looking for? You can view a complete holiday microscope gift guide here. Or call 1-800-942-0528 with any questions.